Its name apparently means ‘vineyard by the sea’ and this couldn’t be more appropriate for the beautiful coastal village of Banyalbufar, on the northwest of Mallorca. Wine was made from grapes grown here from the time the Moors occupied the island, until the dreaded phylloxera plague devastated the island’s wine industry in the late 19th century. Today wine production on Mallorca and in the village of Banyalbufar is thriving. 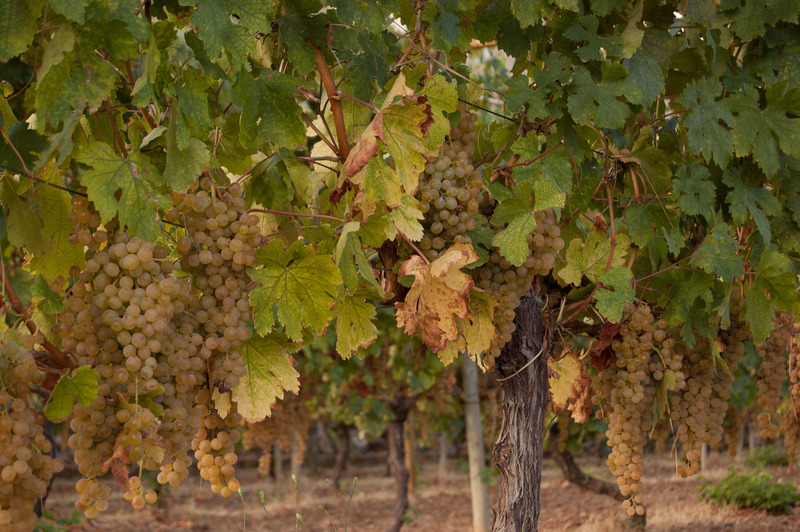 The wine made at the latter’s bodegas is from the malvasia grape – which thrives in the salty air of such a location. Tomatoes too . . . The village is best known for its picturesque terraces, sculpted from the sides of the mountain so that the people could grow crops on the challenging terrain. Ramallet tomatoes – used in the Mallorcan staple dish pa amb oli – are widely grown here. They have excellent keeping qualities and, when ripe, are sewn onto string and hung up until needed. For The Boss’s birthday (yesterday), we went to stay in the village for a night. We came here because, although we had lunched at 1661 Cuina de Banyalbufar a couple of times, we’d never had dinner here. It’s just too far to drive home after dinner, with some good wine – so an overnight stay was called for. 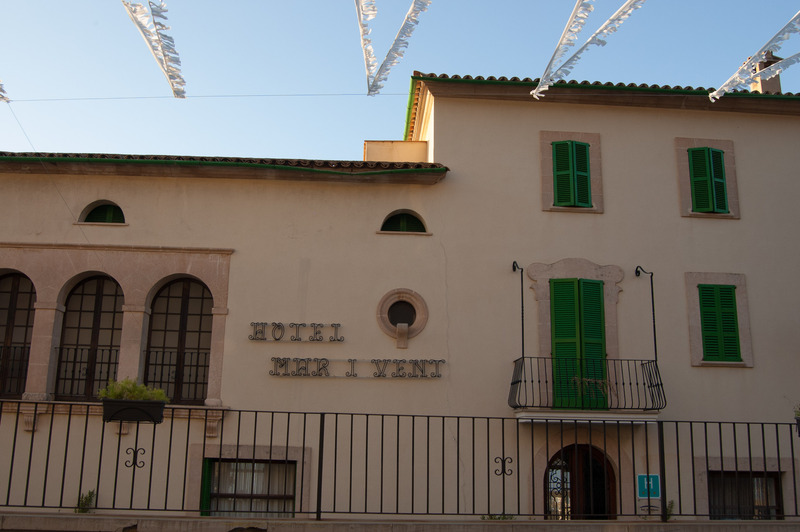 We stayed at the 3-star Hotel Mar i Vent in the village. The name means sea and wind. It’s a hotel I first heard of two decades ago, when a work colleague told me he visited with his wife every year for a walking holiday (there are some great walks in the area). Yesterday we finally stayed at the hotel, which has been run by three generations of the same family. All rooms have sea views, there’s a decent outdoor swimming pool and terrace with loungers, an old tennis court (which probably wouldn’t impress Rafa Nadal), parking, and heaps of traditional charm. It certainly seems popular with British clients (I found some Marks & Spencer clothes hangers in the wardrobe and heard quite a bit of English spoken), and I can understand why so many people come back year after year. It’s relaxed, friendly, and has a great location. The hotel has a restaurant – with a terrace for alfresco dining – but we were dining out, so I can’t comment on the food. Eating at 1661 Cuina de Banyalbufar (Tel +34 971 618 245) is worth the drive (and an overnight stay if you want to take full advantage of the wines – and any of the 40+ types of gin in the bar!). I don’t often eat steak, but the Argentinian beef I had here was the best I’ve ever had. The Boss had duck and raved about the sauce it came with. 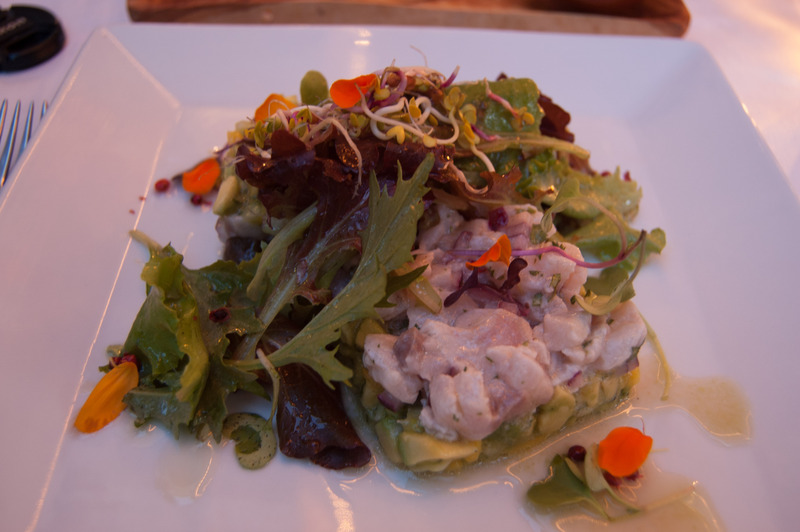 Sea bass ceviche with mango and avocado, at 1661 Cuina de Banyalbufar. It’s a German-owned restaurant: Julia is front-of-house and her parents cook, using fresh local (and often organic) ingredients. Michael, one of the serving team, made our evening particularly special. He’s one of those restaurant characters you remember for a long time, and was a lot of fun – managing to be funny in English and Spanish (although he’s German). This morning we walked the winding path down to Cala Banyalbufar, a tiny rocky cove which has only just reopened after a closure resulting from dangerous falling rocks. As you walk down, there are cute little stone properties, with small huertas, or vegetable gardens. You also spot one or two places where properties have fallen away. 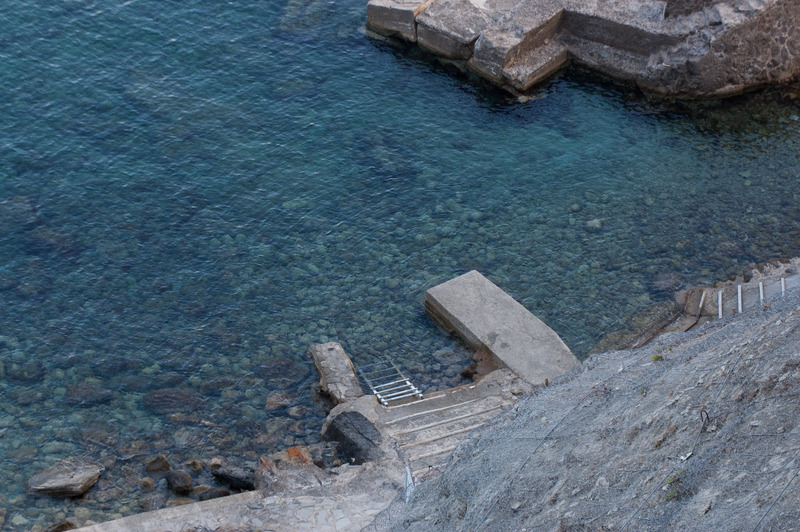 When you live in this part of Banyalbufar you are living on the edge, in more than one sense of the word. 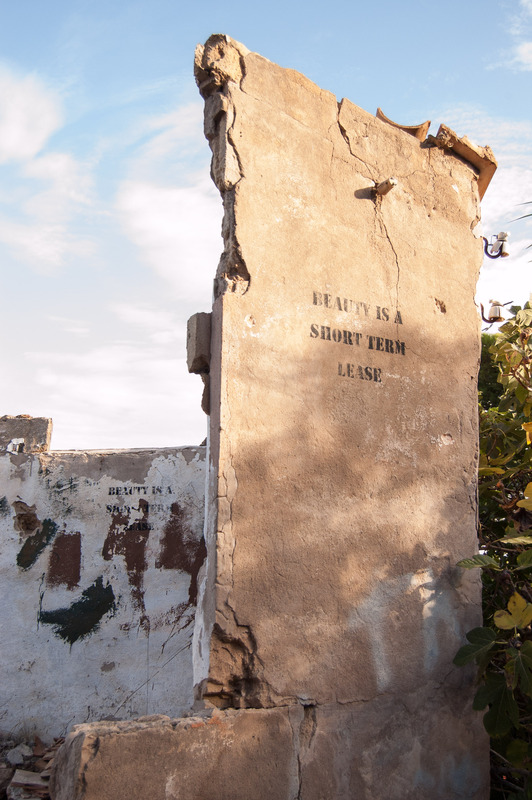 Beauty is a short term lease: words of wisdom on a Banyalbufar ruin. 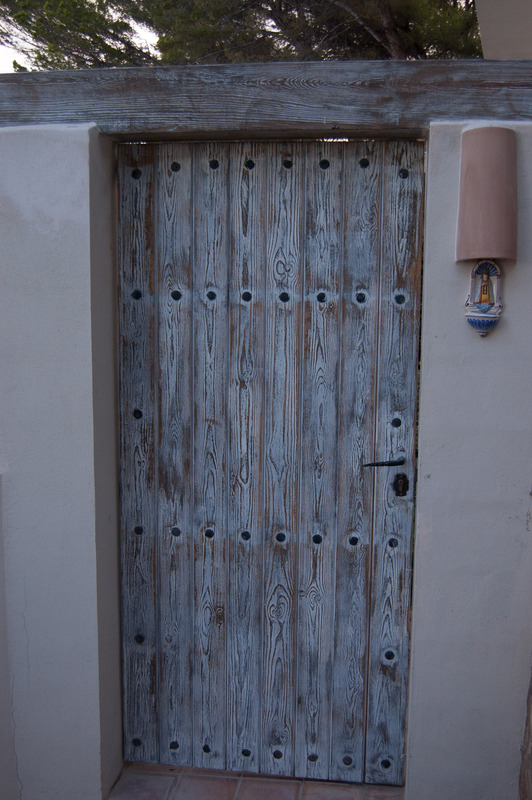 An attractive gate, spotted during our walk. We’ve already decided that we’ll go back to stay in the village again, because it’s peaceful, and picturesque, and has a very different feel to other places on Mallorca. 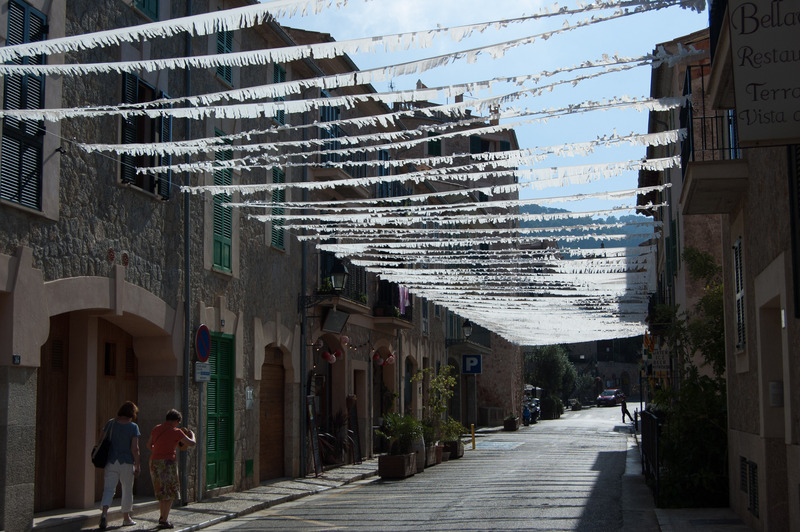 But it won’t be very peaceful this weekend: the bunting is already flying, as the annual village fiesta starts tomorrow. Let’s hope the guests at the Hotel Mar i Vent will enjoy the party . . .
We loved the blog it had a nice feel to it, glad you both enjoyed.